Last night, on Survivor: Heroes Vs. Villains, Candice finds herself on the outs with just about everyone after flipping alliances. Jerri makes a good point that it's tough to trust someone who would abandon their tribe so quickly just to get ahead a little bit in this game. What stops that person from flipping right back if it would benefit them? For now, it's Rupert's head that's on the chopping block. 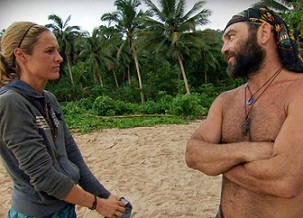 Feeling disgusted with Russell's actions, Rupert tries to rile him up in front of the tribe to try to form a few cracks in his alliance. Unfortunately for Rupert, Russell (though paranoid at times) is a mostly even tempered guy. He knows what Rupert is trying to do, he's not going to fall for it, and he even ridicules him until he gives up. The players are thrown for a loop when they learn that their first challenge is not for reward, but immunity. That means there will be two immunity challenges, two tribal councils, and two people headed to the jury. In this challenges, players stood on a perch and held one hand above their head, tethered to a bucket full of paint/colored water. When their arm gets tired and drops, the bucket dumps everything on them and they're out. Along the way, Jeff would bring out food items to tempt people to drop out. The first item that comes out is cookies and milk and without hesitation, Sandra and Russell drop out. Colby also bows out for some food. Apparently, Colby feels no need to win any challenge ever unless it involves shuffleboard. Also, he obviously feels that he doesn't need to work to save himself or anyone else in his alliance. Keep mailin' it in, Donaldson. Candice, Danielle, and Jerri peace out as well, leaving just Parvati and Rupert to go at it. The old pirate shakes and sweats til he drops and Parvati wins immunity. You gotta admit Rupert. He's a fighter. In actuality, Sandra found it and will be holding on that to further her game. Nice. At tribal council, Rupert doesn't play the rock and Candice is blindsided and voted out of the game. That's what you get for flipping. Dope. The next immunity challenge is one of those challenges where the Survivors have to complete a series of tasks. The first five to dig up a peg, move it through puzzle, and break a plate move on. Those five then have to use pegs to climb up a really steep wall and the first three move on to the final round, which is to solve a slide puzzle. Russell wins only his second individual immunity idol in two seasons. You have to respect that. He doesn't get by dominating the individual challenges, that's for sure. It seems like Rupert would go home, doesn't it? But Rupert isn't a threat really. He hardly made any decisions and he's not great in challenges so he's a guy you want hanging around in case you want to use as an option for final two or three. Instead, Russell focuses on breaking up the pair of Danielle and Parvati and pits them against each other. When the girls talk it out, Russell steps up his game even further, campaigning to get rid of Danielle. At tribal council, he keeps up the lie that Danielle was trying to get rid of Parvati, bringing Danielle to tears. She's a tough cookie and for her to break down, she must really be at the end of her rope. While trying to defend herself, she basically blurts out in front of everyone that she and Parvati are a very strong twosome and that seals her fate. She is voted out of the game and is the night's second blindside. Russell, you are seriously evil. Survivor: Heroes Vs. Villains airs Thursdays at 8/7c on CBS.